If we speak about cultural relations particularly in the music, it should be noted that borrowing in the field take place very easily and spread quickly over a large area, because the music is connected with specific objects, the use of which is not too difficult for people endowed with an ear for music and a desire to show their talent. The first musical instruments occurred on the basis of targeted modernization of household goods and tools. For example, using a bow like a musical instrument was initiated when it was noticed that stretched bowstring may make listenable sound, and hollow pots, in certain cases, may enhance a sound driving resonance with it. Besides tapping the empty bowl also makes it possible to obtain pleasant sounds. We find oldest elementary music terminology at the ancient Bulgars, a people of Turkish origin, living wide expanses of Ukraine, and for some time known in history as the Scythians. For several centuries, the Scythians were in close contact the ancestors of the Hungarians, which we here call the Magyars. Their homeland was in the south of the common Finno-Ugric territory bounded by the Volga and the Don Rivers. In the days of yore the Magyars were neighbors of the ancestors of the Mari. Between these nations existed language and cultural exchange, including music, as can be seen below. Now many known names of musical instruments have one source of origin in the Bulgarish language, which has a continuation in the modern Chuvash. Of course, the first musical instrument of the Bulgars, whose name in izmenennіh forms spread in many nations, is very different from many of its later modifications. Just the names of the bandura and mandolin, as well as many other musical instruments go back to one source. Relation of these names has no doubt, but it is not clear where and why bandura turned into a mandola, a smaller model which was the mandolin. Thus the word "bandura" is primary, and its origin is associated with the Lat pandura and Gr. πανδουρα "cittern" and its source are looked for in Lydia. (VASMER MAX. 1964. Volume 1, p. 120). Obviously not found, as the roots of words are in the language of the ancient Bulgars, as it is evidenced by Chuv. păntăr-păntăr – imitation of strumming strings, păntărtat – 1. to strum, produce strumming sounds (of a stringed instrument), 2. pop, rattle (on drums) and like. What Chuvash words have a more common sense, means that the stringed musical instrument was borrowed by Indo-Europeans (Greeks and / or Italians) from Bulgars, and not vice versa. At the same time they also borrowed its name. This happened about four thousand years ago, when the Bulgars from their ancestral home in the Lower Dniester switched on Right Bank of Ukraine and came into contact with the Indo-European tribes (see the section Türks as Carriers of the Corded Ware Cultures ). The Scythians-Bulgars held music in high esteem, as evidenced by the image of the musician on the so-called Sakhnovska plate, which is part of the headdress, and finding remnants of musical instruments during archaeological excavations. 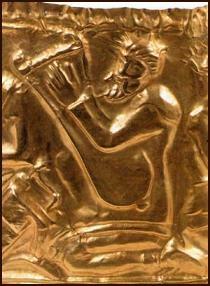 There is scant historical evidence that the Scythians had their own five-string musical instrument. This information, analysis of Sakhnovsky musician' posture and musical instrument in his hands, its comparison with the ancient and modern folk ones allow restoration of the appearance of the instrument (see. on the right). Inherent design features have numerous counterparts in the Eastern tradition, so it can not be imported (OLIZNZK O.G.. 2004: 42. Fig. 2). The peoples of the Caucasus have names for musical instruments like the Latin word pandura [(Osset. fændyr "violin", "balalaika", "accordion", "lira", Georg. panduri (ფანდური) "stringed musical instrument similar to a lute"and others], but the source of the borrowing, just as words bandura, difficult to define. Musical instruments with a similar name – Fr. tambourin (long drum), Tat. dumbra "balalaika", Cr.Tat. dambura "guitar", Tur. tambura "guitar", Kazakh. dombra (a type of balalaika), Mong. dombura are used by many Asian and European peoples. It is believed that their names have Arab origin (Ar. tanbūr "stringed musical instrument"). However Chuv. tĕmpĕr-tĕmpĕr "imitation of drumbeat", tĕmpĕrtet "to rattle" (of drum) cast doubt on this, since the similarity of words păntăr and tĕmpĕr speaks to their common Türkic origin.Одновременно ими было позаимствовано также его название. Это произошло приблизительно четыре тысячелетия назад, когда булгары со своей прародины в низовьях Днестра перешли на Правобережную Украины и вступили в контакт с индоевропейскими племенами (об этом см. раздел Тюрки как носители культур шнуровой керамики). Melody is one of the most important musical events. However its studying has been much less developed than other part of music theory (PAPUSH M. 1973: 135). From the time of this writing, it took several decades, but the situation has not changed. It seems that after the first attempts to find patterns of the mood building musicologists have recognized the complexity of the problem and now they just do not come it radically solve. Words known theorist that "musical folklore has no knowledge system, and represents the sum of observations" (RUBTSOV F.A. 1973-2: 10) stay in much so actual, as at the beginning of the last century when musicologists bolder than now, took up the study of folk music, relying more on their own subjective perception of folk tunes, despite the understanding of the unreliability of intuitive inference. Nevertheless, we can trace some progress in musicology by comparing Carpathian and Hungarian music, as it will be shown below, is also relevant to our topic. For western Ukrainian folk dance music is most common so-called kolomiyka… So-called shepherds' Hungarian song material are compared with Ukrainian kolomiyka and are their more or less modified forms. Ther are in Hungarian folklore about 30 groups of variants of these songs. Compared with all musical material, they are quite a small amount, so that the influence of Ukrainian kolomiyka cannot be considered significant (BARTOK BELA. 1966: 27). Ukrainian kolomiyka → Hungarian shepherd song → recruit music → New-Hungarian folk song (Ibid, 29). Obviously for mastering the ancient Hungarian pentatonic style, nor Ukrainians and Slovaks had no appropriate basis i.e. those "opposing waves" which would facilitate its adaptation (PRAVDIUK O.A. 1982: 78). Already today we can assume that the form of Hungarian folk music, coinciding with Mari and Chuvash material, are likely an influence of the Bulgars, which obliged the Hungarian language about two hundred loanwords (Ibid: 61). Latest Mari materials offer the meantime a new starting point for deciding on the form of "Hungarian kolomiyka". Until now, we, along with Bartok believed that Hungarian type of "swineherd dance"… descended from a common on Carpathian Ukraine form of kolomiyka. However Mari material presents in large quantities as examples for smaller (Carpathian) and for larger (Hungarian) forms of this type (Ibid: 94). To solve this problem it would be necessary, on the one hand, thoroughly investigate all the instrumental and vocal folk music of Eastern Europe, on the other hand, to investigate the possibility Carpathian-Mari touch. It is also natural in further assume Carpathian origin of melodies of another type – not forming fifths structure and having syllabic structure (Ibid: 95). Kolomiykas are the result of specific "kolomiyic" musical-poetic thinking of people, they are present where a carrier of this thinking lives and thogether with him him migrate. Kolomiyka as a certain style cannot be borrowed (GOSHOVSKIY V. 1971: 163). he (Goshovskiy – V.S.) specified Bartok's thought about influence of Carpathian kolomiyka on New-Hungarian song and found out that the reason for this effect were not the individual songs of swineherds, which carriers were mostly of Transcarpathian origin, but the mass migration of peasants from the Carpathians to Hungary after the defeat of the uprising under leadership of Rákóczi. (MADIAR-NOVAK VIRA 2006: 123). This explanation deserves attention, but does not clarify the reason for the similarity of kolomiyka and Mari songs. Taking into account the presence of the ancient Bulgars in the Carpathians, as it is evidenced by numerous Carpathian place names, we can assume that the formation of the folk culture of the modern population of Ukrainian Carpathians occurred by participating ancient Bulgars, who stayed in these places after the departure of the bulk of their relatives in the steppes of Ukraine at Scythian time. Despite the fact that in the future Carpathian Ukrainians suffer from some cultural influence of migrants from Moldavia and Wallachia, they still kept Bulgarish musical legacy. The Mari also borrowed Bulgarish tunes already later when another part of the Bulgars moved from the Azov region to the Middle Volga banks. Other facts can be found in support of this assumption, though they also require targeted analysis of specialists. For example, as well as Ukrainians, Chuvash prefer choral, polyphonic but not solo singing, how they differ from related Turkic and neighboring Finno-Ugric peoples, which are characterized, according to experts, solo monody of one voice (PRAVDIUK O.A. 1982: 76.) It may be noted also that male Chuvash dances, as well as Ukrainian ones, have such elements as jumping and squats.